Film Studio: Columbia Pictures Corp. This would be the first of a trio of elder statesmen roles that Henry Fonda would play in the early half of the sixties. With the election of John F. Kennedy in 1960 and his call to Americans “to ask not what your country can do for you, but what you can do for your country”, the political drama would take center stage in Hollywood for the next few years. 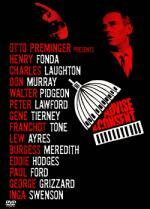 Advise and Consent tells the story of Robert J. Leffingwell (Fonda), the presidential nominee for the cabinet position of Secretary of State, and the travails he endures during the grueling Senate confirmation hearings. The viewer is not only given a front seat to this process, but we see the backroom brokering and backstabbing that permeates our political system. Although Fonda was given top billing, he only appears in the first half hour of the film. The real star of this film is Charles Laughton, who plays the “esteemed Senior Senator from South Carolina”, Seab Cooley. This would be Laughton’s final role before his death in 1962 from cancer and I feel it’s one of his best performances. He plays Cooley as a wizened, old curmudgeon who knows how to get his way in the Senate, by praising, cajoling, chastising or demeaning anyone who blocks his path. Laughton’s portrayal would be the icing on the cake of a career which was rich in characters such as Seab Cooley and his screen presence would be sorely missed. My only complaint with the film lies with the movies musical score by Jerry Fielding. I do not know what film he was watching when he wrote this score but it definitely was not the one I watched. At times the mood of the music in the background seemed better suited for a daytime soap opera, as passages tended to remind the viewer of somber and maudlin elevator music. This one problem with the film does not detract from the viewing experience and anyone who decides to watch this film, will be rewarded with 2 hours of good solid drama.